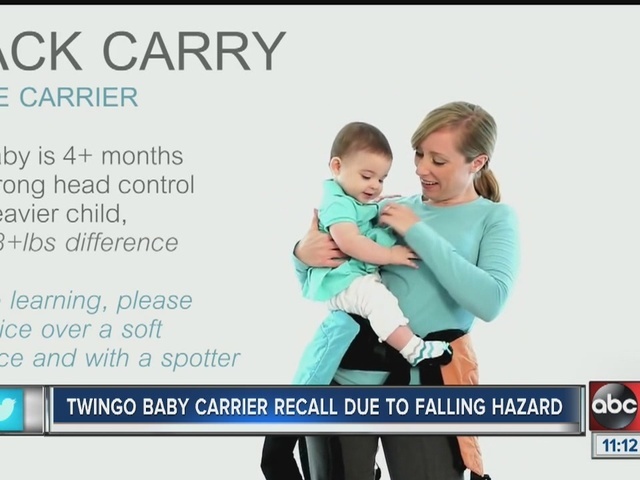 TwinGo is recalling about 4,000 baby carriers because the waist buckle can break, posing a fall hazard to children in the carrier. The firm has received 13 reports of buckles breaking worldwide, including 10 in the U.S., one in Canada and two in the UK. No injuries have been reported. The TwinGo Original Carrier is an infant carrier designed to carry one or two babies against the caregiver’s body at the waist. It is intended for babies that are from 10 to 45 pounds. “TwinGo” is printed on a label located on the front of the carrier and an 11-digit batch number is printed on a label sewn to the waistband. Batch numbers included in this recall: 23014024003, 01515026003, and 21615019001. They were sold in fabric that is black on the outside and blue or orange on the inside. The carriers are believe to have been sold in boutique stores nationwide and online at Amazon.com and TwinGoCarrier.com from December 2014 through May 2016 for about $215. Consumers should immediately stop using the infant carrier and contact TwinGo for a free repair kit. A free replacement buckle will be provided with instructions. A repair video is also available at twingocarrier.com/pages/repairkit .